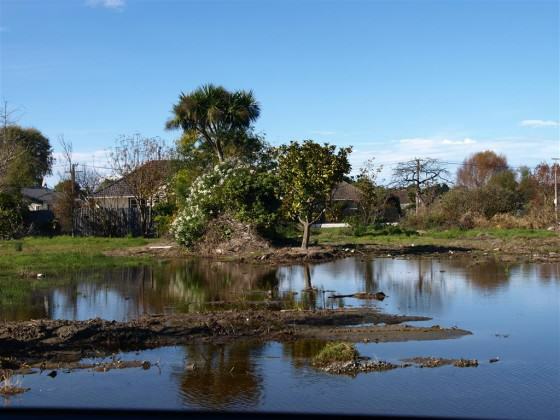 In my first blog way back in December 2012 I introduced you to the Christchurch earthquakes of 2010 and 2011 and the devastation that followed to our beautiful “Garden City”. And also to vegetation studies that I initiated in the “Residential Red Zone” (RRZ), where c. 8,000 properties were abandoned in Feb 2011. So what is happening now in the RRZ? With property abandonment, the sudden cessation of mowing, weeding and spraying raised some interesting ecological questions for us: what plants will regenerate? Will they be native or exotic species? What native trees were on the properties anyway? Which ones should be saved? What were the threats to them thriving? And so on. We expected to see lots of exotic species pop up, as many exotics have quite long-lived seeds. They can lie dormant in the soil for decades, and only germinate when the conditions are right — for example, when the soil has been disturbed. In comparison, the seeds of most native species aren’t long lived, and need to germinate in a year or two, or they will die. So it was a bit of a surprise (and very exciting) to find that oodles of native species were regenerating — cabbage trees for Africa (Cordyline australis), akeake (Dodonea viscosa), karamu (Coprosma robusta), taupata (Coprosma repens), ngaio (Myoporum laetum), Pittosporums (P. tenuifolium, P. eugenioides), lacebarks (Hoheria sextylosa, H. angustifolia), hebe (Hebe salicifolia), ribbonwood (Plagianthus regius). Why? It seems that birds were the answer. 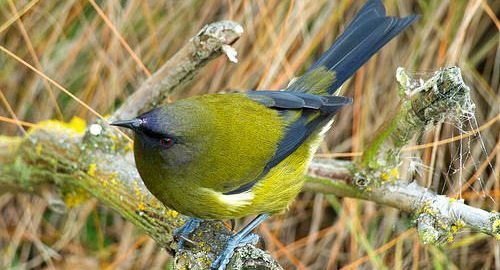 About 75% of the tree and shrub species that were regenerating have fleshy fruits and were being dispersed by native (silvereye, bellbird) and exotic (blackbird, thrush) birds. We also found quite a few exotic species. 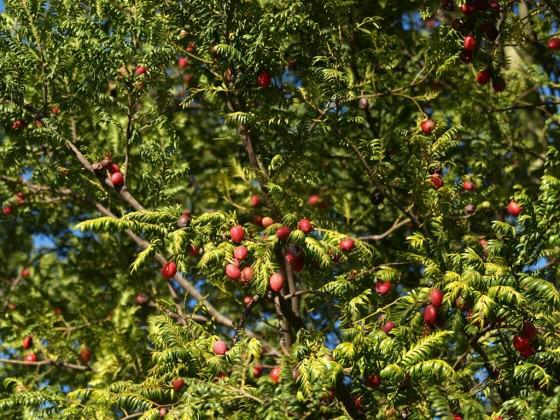 These included bird-dispersed species like yew (Taxus baccata), elderberry (Sambucus nigra), Prunus (plums and cherries), and some nasty invasive species like gorse (Ulex europeaus) and broom (Cytisus scoparius). But on the whole the future looked bright for a regenerating native forest. We have continued to visit those properties and some new ones as well, to see what species are thriving. But sadly we are now being limited — contractors are mowing and spraying herbicide over properties to “lower the fire risk”. Not only that, but with demolition occurring at an increasing rate our treasured seedlings are being scrapped away by heavy machinery. Those diggers are also disturbing the soil on the abandoned properties and exposing the seeds that have lain dormant, which means a lot of those invasive exotic seeds are now germinating. And there’s another force at play that’s giving the exotics the upper hand — species that were being controlled by gardening practices now have free rein. Buddleja davidii (butterfly bush), golden locust (Robinia pseudoacacia), elm (Ulmus), ash (Fraxinus), Prunus, blackberry (Rubus fruticosus), sumac (Rhus sp) and elderberry (Sambucus nigra), and many other species are sprouting up in lots of places. In the course of our surveys we have also discovered some awesome native treasures that have survived on residential properties: a huge hard beech (Nothofagus truncata) in Avonside, several miro (Prumnopitys ferruginnea) loaded with fruit, a massive hinau (Elaeocarpus dentatus) in Dallington, kauri (Agathis australis), native beeches (black, red and silver beech), kanuka (Kunzea ericoides), kahikatea (Dacrycarpus dacrydioides), totara (Podocarpus totara), the list goes on. There are some majestic old exotic trees as well, especially in older suburbs such as Avonside and Dallington — walnuts (Juglans sp. ), weeping elms (Ulmus), maples (Acer sp. ), magnolias, rhododendrons, and many others. We don’t need the silver birches (Betula pendula) though — they are allergenic and this could be a good time to get rid of them. As for sycamore (Acer pseudoplatanus), now is also a perfect opportunity to get rid of this nasty, invasive tree as well. One thing that has become quite noticeable on recent red zone visits is that many treasured old native and exotic trees are now dying for some inexplicable reason. Maybe it is exposure, caused by the removal of houses and surrounding tree that were sheltering them. Maybe the demolition heavy machinery is damaging their roots. Whatever the cause, these trees will be lost. We don’t yet know what the future will be for this land. John Key (NZ Prime Minister) has said that by the middle of this year we might have a clearer picture. It’s now the middle of this year! At the moment the cleared areas are being grassed and fenced into small parklands of scattered trees and shrubs. But that is not a long-term, biodiverse, or even sustainable solution. Grassed parklands need mowing and weed control. They are expensive to maintain. A biodiverse forest, dominated by native trees and shrubs but also containing components of the cultural and historical heritage of the area is a much more sustainable option. We could speed up the return of our iconic wildlife by allowing the remaining small patches to regenerate and by supplementary planting of native species known to attract the native birds, invertebrates, and geckos that are essential in our native ecosystems. This would include the large, long-lived podocarps that naturally grew in parts of what is now the red zone: matai (Prumnopitys taxifolia), kahikatea and totara. 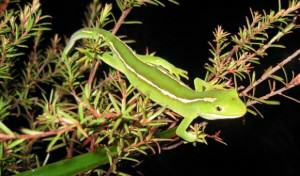 New Zealand green gecko – important pollinators for many native plant species. Photo: New Zealand Department of Conservation. The native vegetation has tremendous resilience, but only if we understand nature and how it works. In years to come, our children, grandchildren and great-grandchildren could have a huge biodiversity asset in the form of an amazing native forest running through their vibrant green city. 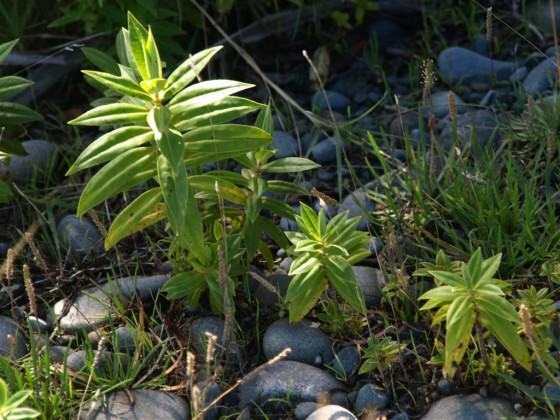 But to achieve that for them, we need to take care of what is left and make sure the invasive exotic weeds don’t get a stranglehold. You can help. We need to know what’s happening in all parts of the residential red zone. 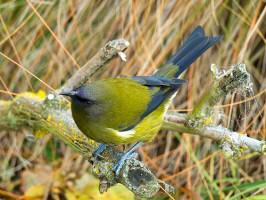 So we’ve set up a project on naturewatch.org.nz for people to post photographs of the plants and animals they see there. You don’t have to be expert. You don’t even need to know what it is you’re photographing — experts on NatureWatch NZ can help to identify species for you. But by contributing, you’re helping us understand just what’s going on. The environment we leave for our children is in our hands. Help us to ensure it’s one they will thank us for. To contribute to the NatureWatch Christchurch residential red zone project go to www.naturewatch.org.nz and search for “Chch residential red zone” under “Projects”. 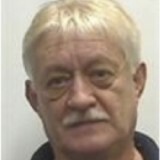 Glenn Stewart is Professor of Urban Ecology, Lincoln University, NZ. Current research is on Southern Hemisphere urban ecosystems and invasive species, successional processes and predicted changes in global climate. I enjoyed reading your article. I wasn’t aware that soil disturbances give support of invasive species. 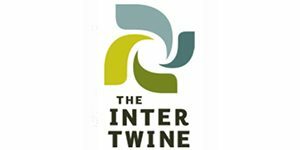 I manage a Conservation Education Centre in Asola Bhatti Wildlife Sanctuary in New Delhi, India. The entire sanctuary is covered with invasive Prosopis juliflora trees and the forest department is uprooting these trees and replacing them with native species. While the acts seems to be appropriate however do you think the heavy digging will give rise to more invasive species. And also what is best way to remove invasive species. Thank you. Another fine article, Glenn. 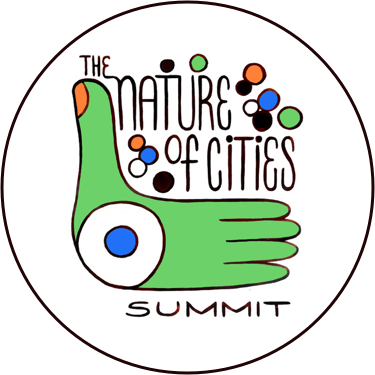 The emergence of opportunity from disaster is such a compelling narrative of regeneration and renewal, if only it could proceed with an eye toward enhancing biodiversity and encouraging native species to flourish. The research you and your colleagues are doing to provide baseline information on the emergent plant communities seems incredibly important to that effort. The NatureWatch effort to crowd-source photographic information about species distribution is a great way to involve citizens, and echoes the use of online tools to advance scientific work in many other areas (to wit: zooniverse.org). 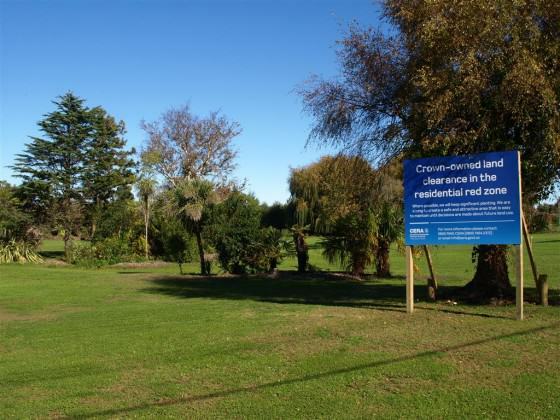 One question: to what extent is the environmental ethos you articulate here — about the incalculable future value of bestowing a thriving native forest upon future generations — present in the officials plans for ChCh’s redevelopment? Development Disasters/Red zone Networks Awareness Governance Economics Pollution Biodiversity Art Ecosystem services Justice Biophilia Culture Parks Wildlife People Interactions Tools Stewardship Gardens Asia Participation/Democracy Planning South America Architecture Design Experiencing Nature Communities Education/Knowledge/Learning Sustainability Policy Resilience Wetlands/Rivers/Streams Climate change Conservation Water Health Livability Value North America Landscape What is urban nature?